Dazzling 4 claw rectangular radiant cut diamond solitaire pendant with modern setting and supplied with 18 inch chain. Featuring a Radiant cut Diamond of your choice, this Diamond solitaire pendant will look beautiful with any outfit. 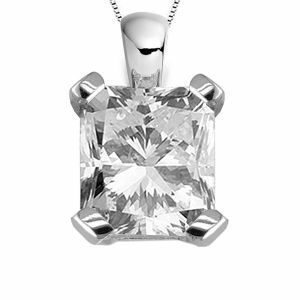 Your Diamond will be set within the simple yet elegant 4 claw setting, and will sit upon an 18 inch chain, which is supplied with the pendant. With a choice of Diamond carat weights, colours and clarities, there is a wide variety for almost every budget. We can craft your pendant in either 18ct Yellow Gold, 18ct White Gold or 950 Platinum. Please allow us approximately 2-3 weeks to craft your pendant in your chosen precious metal choice. It will then be delivered straight to your door by a secure courier presented beautifully in our Serendipity Diamonds packaging.